Last night we were being so productive at our house that I completely forgot to post. I pulled about a dozen clothing items and a dozen pieces of jewelry pulled out of my closet and ready to leave our condo! Also packed up another box to go into storage yesssss! Those were the biggies we accomplished a lot of smaller things too. Now for the fun stuff ... talking about my birthday weekend!!!! The weekend really started off Thursday night when the hubby gave me my birthday gifts. He started off by giving me a new pair of ear plugs for shows. That was sooo great (lots of sarcasm there) I told him the other one better be good! OH it so was : ) My amazing hubby got me the Coach purse I've been drooling over for probably the past 8 weeks!! It's this purse but in black. Love it!!! Used it all weekend. 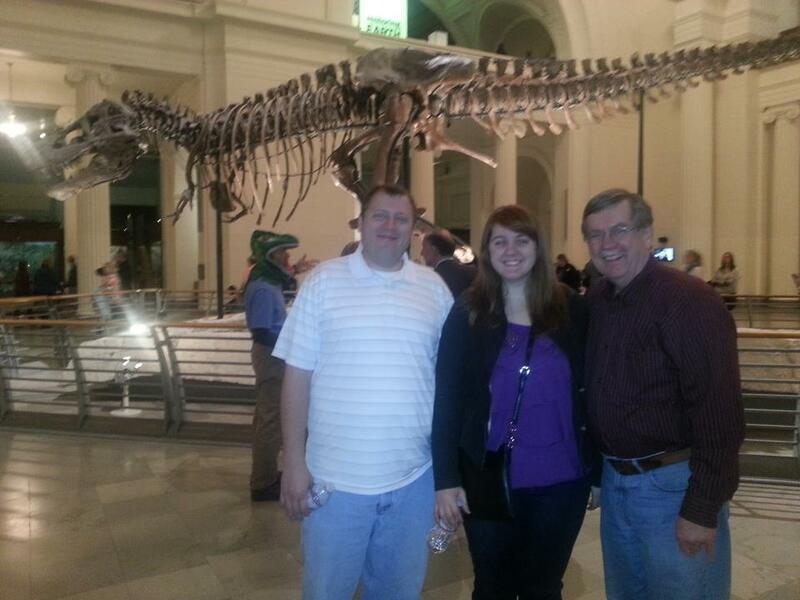 Friday night my parents, Lou, Bethany and I went to member's night at the Field Museum! Like always it was a blast. The best part was showing Lou & Bethany everything since they had not been before. 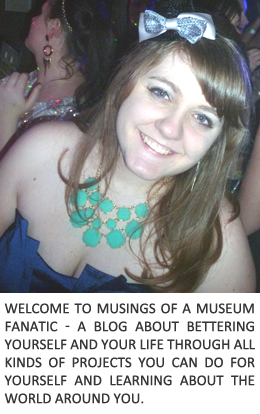 This was actually the first time Bethany had ever even been in the Field Museum?!!? I know right, we will be going back and I will be showing her everything! View of the Field Museum from the car. This was the least blurry of the photos I shot. There was so much more than what you saw from my photos it really is the coolest thing. Check out the Field Museum's Flickr Page (you can see the photo of my family with a really old Gar. Also check out the Field Museum Library's Flickr shows you more of the images I worked with!! Saturday was great as well. I ended up back in the city to have dinner with Stephanie and Tara. We went out to dinner at Shine Restaurant in Lincoln Park and I was able to check off one of my 101!!! 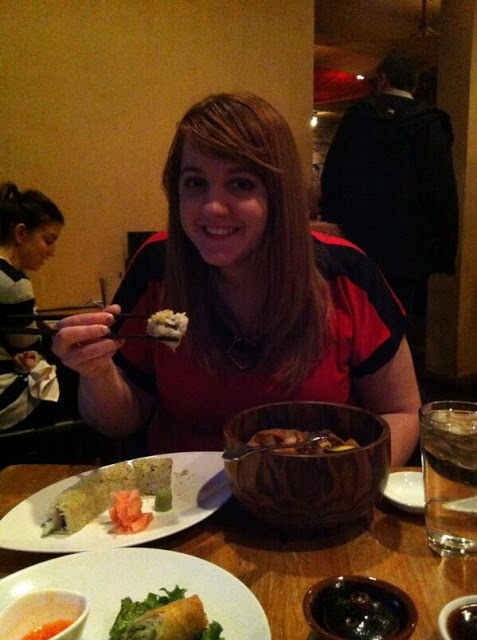 I ate sushi. I stole this photo from Stephanie. Me having my first piece! I had a Honey Roll which is white tuna, cucumber, and sesame honey sauce rolled in tempura crunch. It was yummy! I shouldn't have done the noodles and the sushi that was waaaaaay too much haha. Tara and I split crab rangoons too, next time we need to split more ha. Sunday was a travel home and hang out day. I went over to Kevin's parents for a little bit to see his brother and his wife who were in town to celebrate their anniversary. Kevin ended up getting home later that evening. Unfortunately for Kevin I had brought back a little too much Hawkeye with me and Kevin had a bit of a reaction after our cuddle session. Oops! He's ok and he still thinks Hawkeye is adorable. So all in all it was a great but really tiring birthday weekend. Thanks for all the birthday wishes! Don't forget to enter my giveaway from Friday either!!! the museum looks so cool!! And isn't sushi so yummy? I could eat it everyday hahaha!! This is weird but I can never comment on your blog if I try commenting directly from bloglovin...is it just me? I love your new purse! I am not a sushi fan, but I am a fan of crossing things off of my lists. Yep your field photos totally creep me out. Blah.